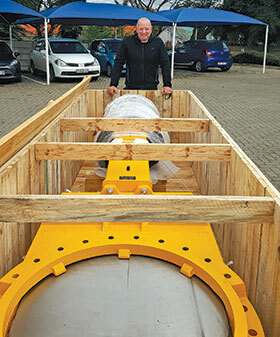 Afrivalve, the sales division of specialist valve manufacturer Johannesburg-based eDART Slurry Valves, recently delivered DN800 C-Tech valves to a customer in Africa for use on a mineral processing plant. Due to the recent expansion in factory facilities, Afrivalve now manufactures up to DN800 as a standard with larger sizes upon request. Group marketing manager, Greg Hopton said, “Being a local manufacturer gives us the flexibility to give the customer exactly what they need. With mining and heavy industrial applications having their own complex challenges, we are able to tailor-make the valves accordingly. We choose our materials for construction based on customer requirements and budget. For instance, we can offer SAF2205 wetted parts with a mild steel pedestal and 304SS actuator. The combinations are endless and we are here to ensure that our customers are supplied with the combination that best meets their requirements. Afrivalve stocks a full range of instrumentation that complements its actuators. Additionally, the company can supply manual hand wheel, manual gearbox, electric and hydraulic actuators. Valves are available up to PN16. For applications requiring higher pressures, Afrivalve’s Red Roc pinch valve would offer the preferred solution.